As I promised (about a month ago) I have not yet unveiled my new Logo. You may have caught sight of it on my Twitter and Facebook banners down the side, but I thought I would give you a close up here, because it is so pretty. I had no idea how long it took to create your own logo, what a nightmare, but what a brilliant job Leigh Morris did - I for one love it! Most of you reading know that I am very new to the world of blogging - known as the Blogosphere (possibly only by me, I am not sure it is in the Oxford Dictionary?) Oh, I just checked it is. Ok so probably more than just me uses the word blogosphere. Anyway, my point is I am but a novice and so I take great interest in reading other people blogs and seeing what people get up to, especially crafty blogs - I've already told you all about #Craft Blog Club (7-8pm Tuesday nights on Twitter) but while I was cruising around Twitter last week I spotted a Tweet from a lovely lady called Clare asking if anyone with a blog wanted to do a Badge Swap. Badge Swap? What is a badge swap I thought? Google is my best friend and Google told me a badge swap is when you both put each others Badges (logos to you and I) on your site so that your readers can pop over and see even more lovely blogs. So Clare very kindly added my badge to her site (almost 2 weeks ago) and I am hopelessly late, but hopefuilly she has forgiven me, so it is definitely time I shared her badge. Please go over and see Clare at Maybush Studio. Her blog is amazing. You will be enticed by her marvelous photography, brilliant reviews and general cleverness is all things crafty. It has been lovely meeting such nice people over the internet and its amazing how easy it can be, Clare's husband is also in the forces, so it has been nice to speak to someone who knows what its like now Maj C is away and her blog has definitely inspired me to write more. 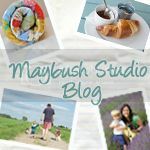 Enjoy Maybush and see you all soon - if I have time to post here...I may be too busy looking at other lovely blogs. Ah Vicki, thanks so much - that was the idea, but you never know how it comes across! Clare, not at all - its the least I could do (and also made me learn some basic HTML "stuff") so honestly no worries. We're all ok, its going a bit slowly but hopefully it will speed up a bit soon. I love your new logo. I particularly love the wonky crown...so sweet!